The USD/CAD pair continued gaining traction and has now moved back closer to 14-month highs touched in the previous trading session. 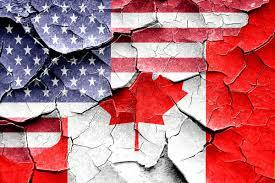 With an initial sharp drop of 100-pips to 1.3530 region on NAFTA news, and subsequent sharp recovery of over 140-pips in wake of a slump in oil prices, it was a highly volatile session for the pair on Thursday. The pair event shrugged off disappointing US economic data and jumped to its highest level since late Feb. 2016. On Friday, the pair built on previous session's sharp recovery move despite of a goodish recovery in WTI crude oil prices, which tends to boost demand for commodity-linked currency - Loonie. The pair even shrugged-off a slightly weaker tone around the US treasury bond yields, and subdued US Dollarprice-action. Today's up-move lacked any fresh fundamental drivers and could be solely attributed to a follow through break-out momentum above the 1.3600 handle. Hence, it would be interest to see if the pair is able to build on the momentum or traders would be prompted to take some profits off the table ahead of today's important macro releases. Today's economic docket features the release of GDP growth number from the US (quarterly) and Canada (monthly), which would help investors determine the pair's next leg of directional move. A follow through buying interest above 1.3670 level (multi-month highs) is likely to lift the pair towards reclaiming the 1.3700 handle ahead of 1.3735 level (Feb. 25, 2016 high). On the downside, retracement below 1.3635-30 immediate support now seems to attract some fresh buying interest near the 1.3600 handle. Any further slide below the said handle would now be looked upon as buying opportunity and hence, is likely to be limited near 1.3575-70 support.